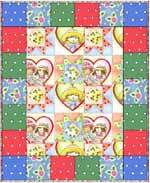 An easy block to have fun changing the colors, adding colors, or setting these blocks in different ways for a quilt setting. 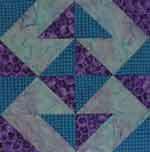 On point can be done with two blocks, but different colors in each block. A 8 Medium Cut four 3 7/8" x 3 7/8" squares. Cut in half diagonally once. 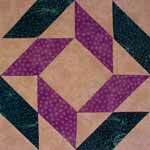 B 8 Dark Cut four 3 7/8" x 3 7/8" squares and cut in half diagonally once. 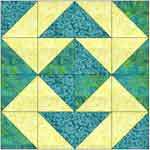 C 16 Light Cut eight 3 7/8" x 3 7/8" squares and cut in half diagonally once. 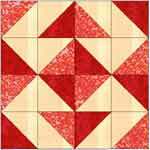 Step 1:	Sew 8 A's to 8 C's to make 8 half square triangle squares. Press seams open or to the dark fabric. 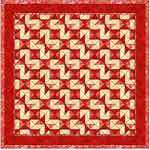 Step 2:	Sew 8 B's to 8 C's to make 8 half square triangle squares. Press seams open or toward the medium fabric. Step 3:	Sew Rows. Look at diagram for placement. Press seams to one side alternating in direction on each row. Row 1 and 3 to one side and Row 2 and 4 to the other side. Step 4:	Sew rows together in order and press seams open or to one side.